It came out on March 2nd that Professor Muhammad Yunus, the Managing Director of Grameen Bank in Bangladesh and “pioneer [of] tiny loans for village entrepreneurs as a way to fight poverty,” was forced out of the bank. The government of Prime Minister Sheikh Hasina, through a notification by the government finance ministry, issued a statement that Mr. Yunus was to be removed. The New York Times reported that the Bangladesh Bank, the country’s central bank, had terminated Mr. Yunus on the grounds of a “technical violation,” citing that his appointment as Managing Director had never been approved by the central bank. The High Court of Bangladesh upheld Mr. Yunus’s removal. This most recent episode marks an ongoing row between Mr. Yunis and the Bangladeshi government; a conflict previously commented on by one of CGP’s earlier posts entitled: “Microfinance: Shunning Down? ?” The consequences of Bangladeshi government action, and more accurately, the government’s opportunistic advance to exert influence over Grameen Bank, are quite contentious and beg questions about what will happen to microfinance should Mr. Yunus be forced out. What role could the removal of the godfather of microfinance have on donor confidence in the bank and microfinance system in Bangladesh? To that point, if Mr. Yunus is in fact replaced and money were to flow out, what impact would it have on Grameen Bank’s Village Phones initiative? 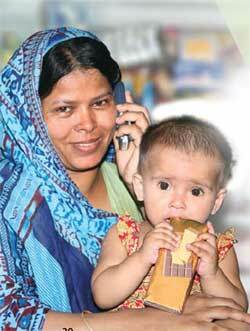 The Village Phones initiative is just one extension of Grameen bank’s microfinance mission. But its impact on development and poverty alleviation has the potential to be quite large. As part of the Village Phone effort, Grameen Bank has extended loans to 398,974 borrowers to purchase or lease a mobile phone. The phone loans are primarily made to Bangladeshi village women, thus the term “Telephone Lady.” In its original manifestation, the “Telephone Lady” would take out a loan from Grameen Bank “to purchase a phone… and provide [payphone] services to the people in her village.” The bank program began operations in 1997. By the end of 1999 there were 950 village phones in service; by the middle of 2002 there were 14,443 village phones (Monthly Reports here). Mobile phone technologies have played, and are playing, an increasingly large role in development around the world. New mobile telecommunication advances, and particularly the speed at which they are becoming affordable, are helping to enrich the lives of users in a number of ways. Michael Klein touched on this in his blog from “Mobile money in 2006 and 2016”. Klein discussed the role mobile technology is playing in “Making Finance Work for Africa”. He sights the Kenyan service M-PESA and its function in “challenging the way we think about banking”. The CGP’s previous post, “A Fab(ulous) Idea?” also provides some more detail on mobile banking. M-PESA uses a system that allows individuals to coordinate monetary exchanges through a “book-entry money (BEM)” system that is managed through mobile phone instruction. The system allows users to manage money exchanges without some of the traditional “brick and mortar” costs of traditional banking. The type of access to money that M-PESA allows users in Kenya to harness provides them with a financial identity. It’s an identity that is uncharacteristic of traditional banking systems in that it provides poor and illiterate mobile phone users with access they traditionally did not have in the old business model. The number of Bangladeshi women who migrated in 2010 was 150,424, according to United Nations, Department of Economic and Social Affairs, Population Division. The total number of migrants from Bangladesh that year was 1,085,345. The total amount of money remitted to Bangladesh, in FY10, as reported by the World Bank, was $11 billion (for yearly remittance inflows to Bangladesh: here). The potential use of mobile phones in this area of flows and development appears to be great. David Roodman’s blog has been tracking the news on Mr. Yunus since the announced ousting on March 2nd. He has raised some poignant concerns with the displacement of Mr. Yunus, indicating most recently that “there are reports of accelerating withdrawals from the Grameen Bank”. The Economist also assessed the potential concern being that “the government’s actions could spark fears about Grameen’s stability, even leading to a run on the bank,” and that “the biggest losers from the government’s bullying would be Grameen’s 8.35m clients, almost all of them poor Bangladeshi women.” Capital adequacy is vital in terms of microfinace and banking more generally. As an institutional benchmark for the fight in poverty alleviation and development, with its many infrastructure components including “Telephone Ladies,” Grameen Bank’s efforts could be severely hampered by the government’s actions as money flows out. The modernization that has taken place in mobile phone services and their applicability in the fight against poverty could suffer in Bangladesh as Grameen Bank looses money to uncertainty created by forcing out Mr. Yunus. Whats more, with any reduction in the growth of Telephone Ladies, the potential for further development in the mobile market towards the creation of a system like M-PESA, which might better allow users to transfer money to family or friends, could be stunted. At the end of 2010 the cumulative number of Village Phones stood at 394,362. In the first month of 2011 that figure was 396,733, and at the end of February it was 398,974. It will be interesting to see what that figure is at the end of March.